Dr. Calcagno has been the Santa Cruz Dentist of choice for families interested in preventative, restorative, and cosmetic dentistry. Let Dr. Calcagno give your smile a makeover. Teeth whitening, veneers, & dental implants can help you shine. Call today! We are happy to assist our patients with dental insurance by filing the necessary forms to help you receive the full benefits of your coverage. The clear alternative to braces. No metal wires or bands to irritate your mouth, and best of all, most people won't notice you're in treatment. Santa Cruz Dentist Dr. James Calcagno helps patients with teeth whitening, aesthetic dentistry, smile make-overs and implants. 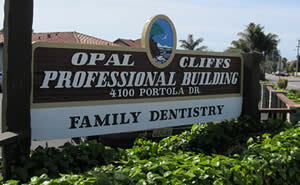 Veneers, dental bridges, porcelain restorations and crowns are also available. Since 1987 Dr. Calcagno has been the Santa Cruz Dentist of choice for families interested in preventative cleanings, dental x-rays, periodontal & oral surgery, TMJ & Headache Therapy. Contact us today at 831.475.4100. We are excited to announce that we are back in our Pleasure Point home! Our phone number and email remain the same. To better serve you, we have extended our hours and are offering evening and weekend appointments. A graduate of the University of the Pacific's School of Dentistry, Dr. Calcagno brings to his practice an integrated background in the biological, chemical, and physical sciences, as well as a sophisticated knowledge and application of dental health technologies. Call us at (831) 475-4100 to make an appointment today! Dr. Calcagno pursues continuing education to remain current on new procedures and methodologies. He is also a member of prominent dental associations and an avid reader and researcher of professional journals dedicated to the very latest in dental care practices.